This peak is #26 on the Height List for British Columbia .Located just west of the continental divide, at the head of the Bush River. 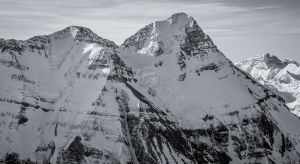 This is referred to as the "Southwest Peak" in most guides, there are also the northeast peak and center peak which are usually traversed to get to the final SW peak. First ascended in 1902 by James Outram, guided by Christian Kaufmann. Journal reference AJ 21-464. Name Notes: Named by Norman Collie in 1898. Bryce, Viscount James (Viscount Bryce was President of the Alpine Club in London.